Poetry provides the best introduction to the marvels of the English language. 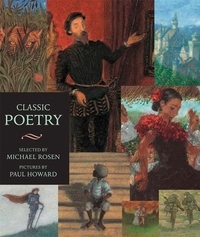 This volume, collected by award-winning author Michael Rosen, presents a glorious selection of classic poetry, chronologically arranged from the seventeenth century to modern day--poems by such celebrated poets as William Shakespeare, Elizabeth Barrett Browning, Henry Wadsworth Longfellow, Emily Dickinson, Carl Sandburg, and Langston Hughes-- complete with biographical sketches of the poets, information on individual poems, and notes on poetic forms. Paul Howard's full-color illustrations illuminate some of the most brilliant poems of the English-speaking world with stunning breadth and beauty. A book to be treasured, Classic Poetry belongs on every shelf--every child should know these poems and keep this book with them as they grow. Back matter includes notes on poems, notes about poetry, and an index of titles and first lines.